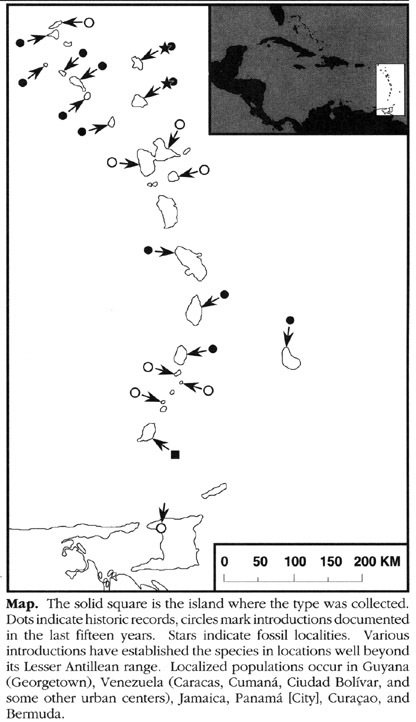 Country distribution from AmphibiaWeb's database: Anguilla, Antigua and Barbuda, Barbados, Dominica, Grenada, Guadeloupe, Martinique, Montserrat, Netherlands Antilles, Saint Kitts and Nevis, Saint Lucia, Saint Vincent and the Grenadines. Introduced: Aruba, Bermuda, Brazil, Colombia, Costa Rica, French Guiana, Guyana, Jamaica, Panama, Trinidad and Tobago, Venezuela. From Kaiser and Hardy 1994. Catalogue of American Amphibians and Reptiles.